If you haven't yet bought into the craze that are corporate ecards you really don't know what you are missing. A genuine photographic image, often 3D, is sent electronically via email to enable you to send a personal message to someone and when you buy one of our subscriptions you can send an unlimited amount so every occasion and event is covered. Any ideas where they have really risen in popularity of late? The workplace. This makes sense when you think about it as wherever you will you have work mates who have become friends and those who you get along but have stayed on the professional relationship side of the fence. Imagine if someone at work has does something spectacular and everyone is clapping them on the back but instead of looking elated they just look embarrassed by all the attention. The perfect solution is this Innovators Are Leaders ecard. The image shows 5 light bulbs and only one of them is alight. 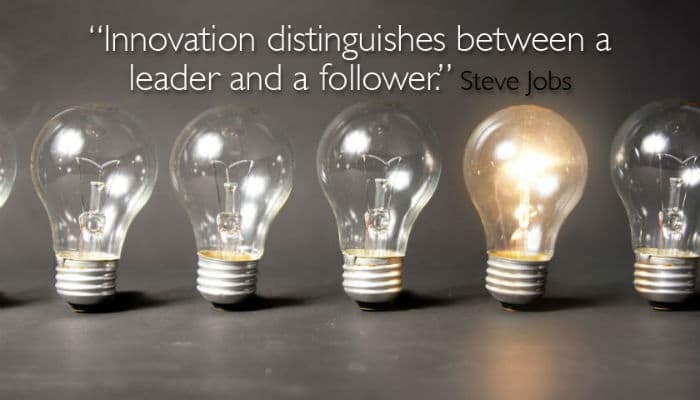 The legend reads “Innovation distinguishes between a leader and a follower”, a quote from the late great Steve Jobs who knew a thing or too about being innovative. Sending these ecards to that work colleague will mean the world to them as not only have you selected something that is prevalent to their achievement but have chosen to do it personally, so they know it isn't false sentiment. Does your business still waste time and money on paper Christmas cards? If so then have a look how cheap and effective our e Christmas cards for business can be.